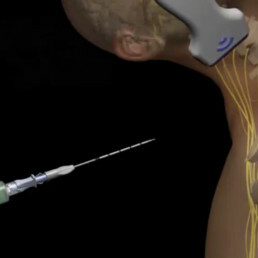 The SOLO-DEX Fascile® Catheter allows for a continuous peripheral nerve block in just five minutes. Save time and improve patient comfort with the patented SOLO-DEX Fascile® catheter for Continuous Peripheral Nerve Block (CPNB). The patented Fascile® Catheter System overcomes the constraints that prevent you from providing a continuous block to every patient. Designed by actively practicing anesthesiologists for all anesthesiologists. Improves self-administered, non-opiate, postoperative pain management. SOLO-DEX Fascile® cPNB is inserted using one hand, by a single operator, using ultra-low doses of the local anesthetic solution, and without the need for sterile drapes or gloves. Patients report fewer side effects such as phrenic involvement, Horner’s syndrome, hoarseness, and excessive numbness. It also lowers the need for opioids and often eliminates them completely. This continuous pain management reduces doctor visits and hospitalizations due to uncontrolled pain. The SOLO-DEX Fascile®cPNB simplifies and accelerates cPNB placement; improving patient comfort and post-procedure pain management. Patients report the need for opioids is drastically reduced and often eliminated altogether. With the SOLO-DEX Fascile® device, placing the catheter is a simple five-minute procedure, it is as easy as inserting an IV and requires no specialized training. Our device can be placed with one hand, freeing your second hand to manage the ultrasound probe, without needing an assistant. The patented design diminishes catheter movement concerns and limits occlusion, precisely addressing the patient’s pain management needs. A patented combination of carefully designed features makes placing a SOLO-DEX Fascile® cPNB fast and simple, ensuring the block is effective. Curved over the needle catheter with multiple distal holes retains its shape, allows for less dislodgement and improved position retention, while optimizing delivery of pain medication to the target nerves. Includes a Touhy Tipped Needle - a standard for the administration of local anesthetic solution near peripheral nerves. The stimulator attachment clip allows for optional nerve stimulation. Dr. Rajendran received his MD from the University of Nebraska Medical Center and completed his residency at St. Luke’s UMKC program in Kansas City. He also did a fellowship in Regional Anesthesia at Virginia Mason Medical Center in Seattle. His 20 years of practice have focused on nerve block procedures for surgery. He trains clinicians in Ultrasound Guided Regional Anesthesia and volunteers as a University of Colorado Medical Center faculty member. Dr. Kopacz has been a leader in regional anesthesia for more than 25 years. He did a Regional Anesthesia Fellowship at Virginia Mason Medical Center in Seattle. He’s authored more than 80 research articles and book chapters on regional anesthesia and was an editor for the Journal of the American Society of Regional Anesthesia (ASRA). He was responsible for changing residency requirements in anesthesiology to include mandatory regional anesthesia training. Jim Kasic is a serial entrepreneur with over 25 years of experience in the Class I, II, and III medical device industry. His range of experience spans large multi-national organizations as well as start-ups with domestic and international scope. Mr. Kasic holds a Bachelor of Science degree in physics, a Master of Science degree in chemical/biological engineering, Masters of Business Administration. Happens only once every four years — bringing together the world’s five regional anesthesia and pain medicine societies as we share the latest research and education for the most efficient, safest, and highest-quality practice for our patients. Held in conjunction with ASRA’s 43rd Annual Regional Anesthesiology & Acute Pain Medicine Meeting. Regional anesthesiology, acute pain, and chronic pain content all in one global educational event…5 societies, 4 years in the making! Protected by one or more patents; patents pending. This website is provided to satisfy the virtual patent marking provisions of various jurisdictions including the virtual patent marking provisions of the America Invents Act and provide notice under 35 U.S.C. § 287 (a). The following list of products and patents may not be all inclusive. For example, some products listed here may be covered by patents in the United States and elsewhere that are not listed, and other products not listed here may be protected by one or more patents in the United States and elsewhere. © 2018 Solo-Dex, Inc., Boulder, CO. All Rights Reserved. Rx Only.